How to Deal With Insurance Adjusters After a Truck Crash | Hupy and Abraham, S.C.
What should I say when an insurance adjuster contacts me after a truck accident? You ask a very important question because your answer could have a significant impact on your eventual financial recovery. Insurance adjusters are doing the work of the insurance companies which employ them. Insurance companies maximize their profits by paying out as little as possible in settlements. Their goal is to get you to settle for as little as possible, and anything that you say may be misconstrued and used against you during settlement negotiations. Once you are aware of the insurance adjuster’s goal, it is easy to see how anything that you say can quickly become a problem. A question as simple as, “How are you?” that is answered with a reflexive, “I’m good, how are you?” can be taken to mean that you are not actually suffering the injuries that you claim to suffer from your truck accident. Even if you are able to get through that question, you can be confident that the insurance adjuster has been trained to ask other leading questions that are designed to get you to make a mistake. You can avoid these potential costly pitfalls by directing the insurance adjuster to your attorney. Once the insurance company is notified that you are represented by legal counsel, all communications—whether verbal or written—should be directed to your lawyer. You will no longer have to deal with the stress of answering questions or the fear that you are making a mistake. 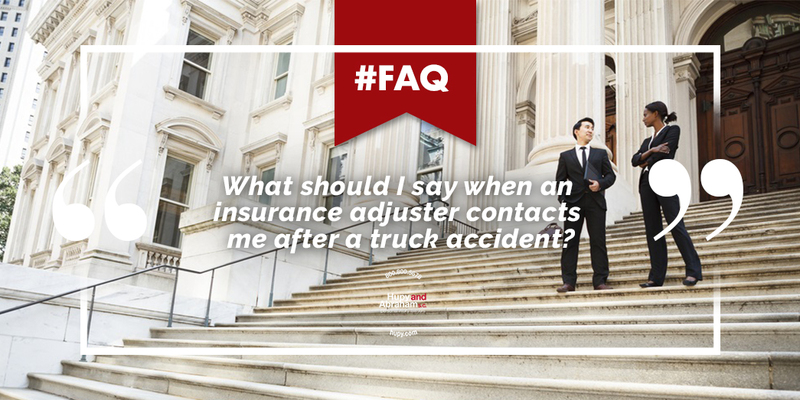 Your experienced truck accident lawyer will not only answer the insurance adjuster’s questions about your truck wreck. Your lawyer will also represent your interests during settlement negotiations and advocate for your full and fair recovery of damages. Those damages should include compensation for all of your medical expenses, lost income, physical pain, emotional suffering, and other costs. Therefore, we encourage you to start protecting your rights now by contacting an experienced truck accident lawyer to learn more about how a truck crash case works and the damages that you might recover. Contact us online or call us directly at 800.800.5678 to schedule your free consultation today.